In Kannada ( my mother tongue) this dish is referred to as palya. Palya means dry fried (dry fried refers to something that requires just a few tsps. of oil) or sautéed, vegetable dish. This is eaten as a side with rice & curry or with roti. We can make palya with a variety of vegetables like carrot, peas, okra, green beans, gourds and pumpkins. 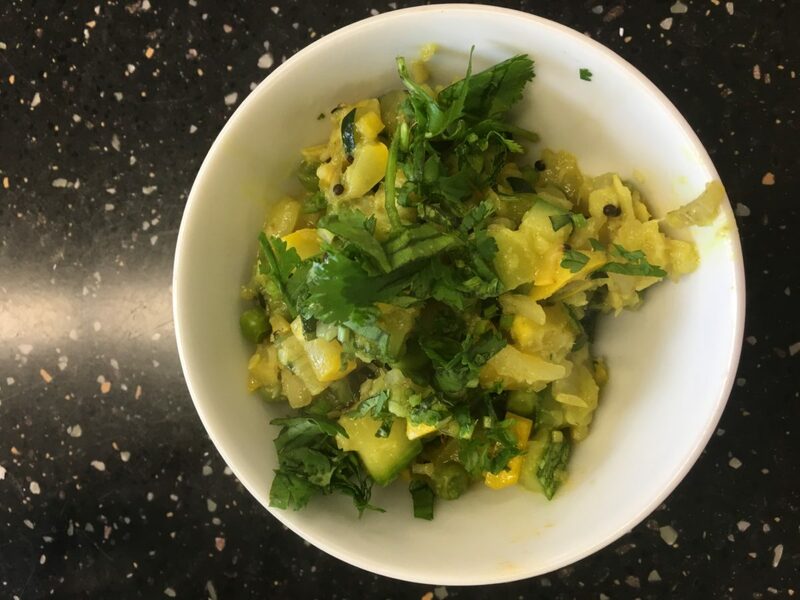 Summer Squash – 2 – cut into small cubes. Fennel head – 1 – chopped finely. Green chille – 2 – slit lengthwise. Curry leaves – 1 sprig – chopped finely. Fresh or frozen grated coconut – 1 tbsp. Add mustard seeds when it starts to crackle add curry leave & green chille, sauté for a minute. Add chopped fennel and sauté till translucent. Add Squash and peas. Cook for 15 minutes at low heat with a lid. When squash is cooked mix in salt and turmeric. Let it cook for 5 minutes. Turn off the heat and sprinkle grated coconut and chopped cilantro.